Neodymium-Ferro-Boron (NdFeB) is the most powerful magnet, with a maximum energy product going up to even more than 50 MGOe. As protection against corrosion Neodymium magnets are provided with a coating that can consist of Nickel, Nickel-Copper-Nickel, Zinc, Tin, Aluminium, Teflon or Epoxy. These magnets are used, among others, in motors, megaphones, separators, MRI scanners, windmills, electronics and vehicles, usually in combination with sensors. Pressed out of rare earth materials neodymium-iron-borium. Machine with diamond tools and cool with copious amounts of water. Temperature range: standard up to +80 °C, specials up to +180 °C. 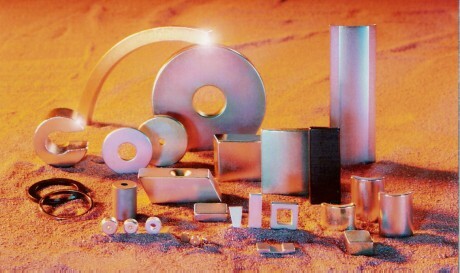 Neoflux® magnets are usually made with a coating to protect against oxidation. A zinc or nickel coating is standard. Available on request: epoxy coating, tin coating, aluminium coating, nickel-copper-nickel or double coating. Available in a wide range of shapes and dimensions (without extra tooling costs). Available in standard and stabilized versions.